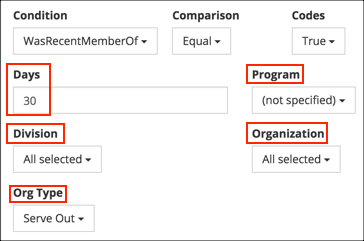 This Condition located on the Enrollment History category tab in Search Builder allows you to look back a number of days to find everyone that was enrolled in a specific Program, Program and Division; Program, Division, and Organization, or a specific Org Type. Because this looks back a number of days, this is the type of search you can save and run without having to change a date. If your church uses Org Types, this is a good Condition to use to find how many people enrolled in a Serve Out type of organization. You might have multiple orgs for these types of events, but using a look back number of days and an Org Type keeps the search simple and perfect for running anytime. You can see how many people were involved over the past number of days.